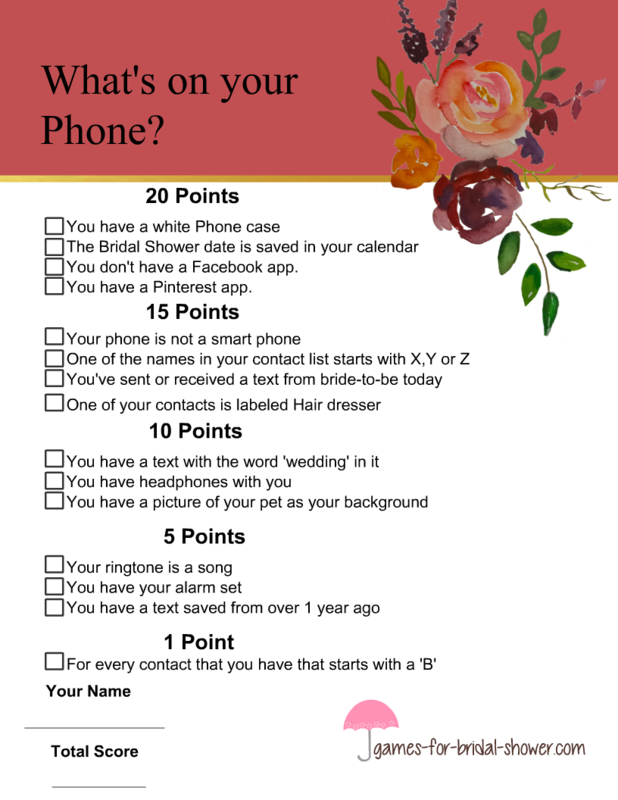 This is a modern day version of What's in your purse bridal shower game. This fun new game will be liked and enjoyed by all of your party guests as almost everyone carries a mobile phone with them. This game is getting very popular these days and I am sure that your guests will enjoy playing it. How to Play: Print the game card in color of your choice according to the number of family and friends who will be participating in bridal shower activities. . Distribute the cards among the guests along with a pen or pencil. Ask them to check the box in front of each statment given on the card. Like if someone has a white phone case, they should check the box and they will get 20 points for that. They should leave the box blank if any statement is not correct for them. Like if a person doesn't have a Pinterest app. they should leave the box given with it blank. At the end of the game each guests should count their points and write those down at the end of the game card along with their name. The person who scores maximum points will be the winner. Click on the image shared above to view the larger version of this game printable. You can save the image by right clicking on it. This beautiful game card has a header in taupe color. The cute printable is decorated with images of cell phones and wedding bells. I am pretty sure that your guests will thoroughly enjoy this party game. This is another cute printable for this modern game. Just click on the image shared above and the bigger printable file will open up. This pink color will go with many bridal shower party themes. 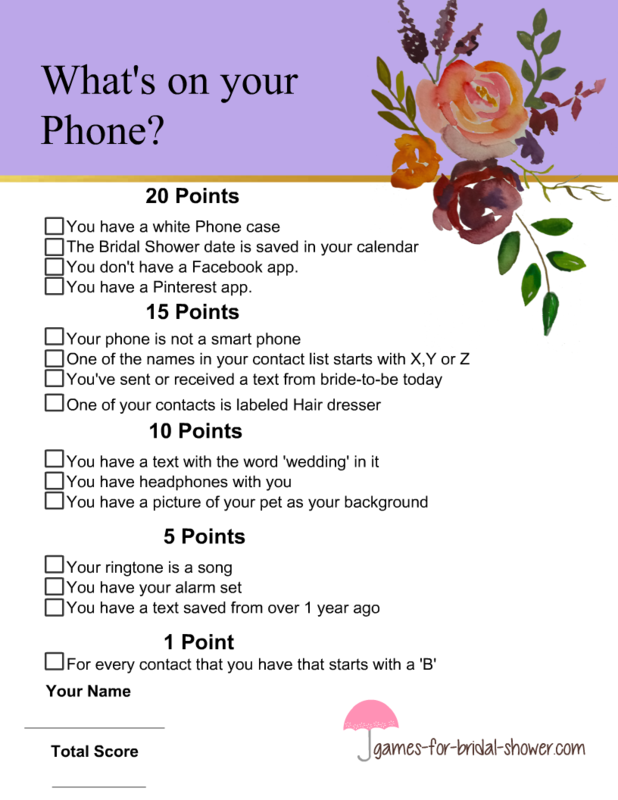 You should print these game cards one day prior to the bridal shower party. That will make the things really convenient for you. This is another color for this game. Cute white wedding bells and black mobile phones make it really pretty for your party.